One year later, Circle of Blue’s senior editor Keith Schneider returns to India to dig deeper into water, food, energy challenges in the region. North of Rampur, along the Mandakini River in northern India, the 25,000-foot snow peaks of the Himalayas reach higher than any of the world’s mountain summits. Click image to enlarge. OKUND, UTTARAKHAND, India — We made the crossing at night from Chamoli, reaching the Himalayan foothill town of Okund after dark. The innkeeper — anxious for guests in a travel economy that came to a standstill in mid-June — cooked dal and nan for dinner and then showed us to a room that was unlit and unheated. It didn’t matter. Thick blankets kept us warm. At dawn, we awoke to strong black coffee. The 21,000-foot Sumeru summit was lit up by the sun, turning the rock and snow from pink to orange to white. The lower slopes, terraced by generations, dove to the fast-moving Mandakini River. The current poured over gravel and boulders, the sound of it rising out of the tight valley like a beast’s heavy breathing. For five long days, I have traversed this region of the Himalayas in the company of Dhruv Malhotra, a young New Delhi-based photographer, and Vinod, a professional driver who was raised in the hills. I’ve come to understand the consequences of a flood in June that, according to researchers at the Wadia Institute of Himalayan Geology, trapped and killed as many as 30,000 Hindu pilgrims during days of terror. Steep mountains; fast moving water; active towns. These are the principle metaphors in the Himalayas. So is danger. This is an unforgiving landscape. On June 16 and June 17, the mountains unleashed such fury that four towns on two rivers – the Mandakini and the Alaknanda – were washed away. Entire sides of mountains slid into rivers, and with them came whole sections of mountain highways. Dozens of one-way-in, one-way-out towns and several larger cities were cut off for weeks, supplied with food and fuel by the Indian army. I’m back in India for a month, just as I was at this time in 2012. I’m here on assignment for Circle of Blue and our partner, the Wilson Center’s China Environment Forum. Over the last three years, we’ve collaborated on our Global Choke Point project in an attempt to understand and relay how nations are responding to the resource confrontations that now define so much of our economy and our global condition: the rising demand for food and energy in an era of diminishing freshwater reserves. 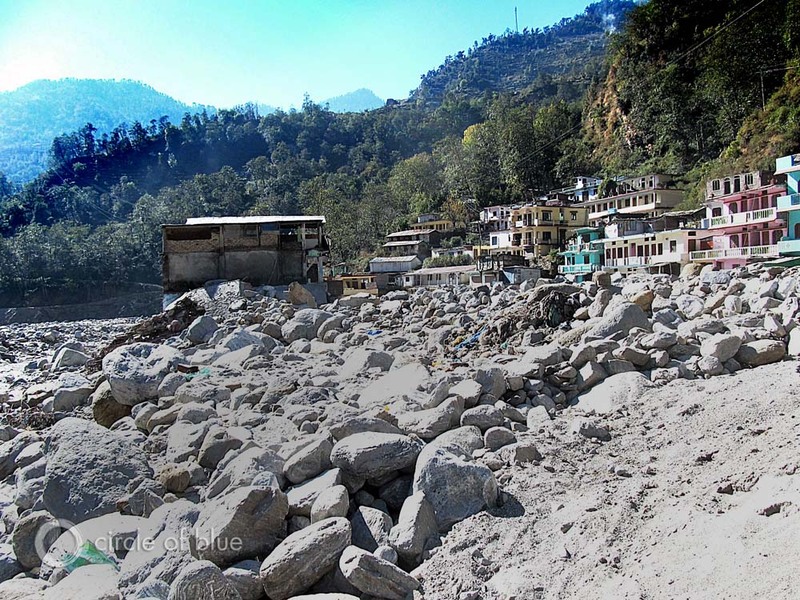 Much of Sonprayag, along the Mandakini River in northern India, was buried in the rubble of a Himalayan flood in June. Downriver, a dam that had been under construction was washed away. Click image to enlarge. In our Choke Point: India reporting from last summer, I wrote about India’s cycle of risk, which involves surplus grain production in western states and rising coal production in the east. This year, we want to dig deeper into India’s coal production and consumption cycles, its solar and wind sectors, and its ambitious program of hydroelectric development. It’s the latter that prompted this trip to the Himalayas, where India says that it wants to build the bulk of the 292 new hydroelectric power projects that are either already under construction or are proposed for the region. India already has 186 operating hydro projects that account for a bit less than 15 percent of the country’s electrical generating capacity. There are – or were – 15 operating projects in Uttarakhand before the flood. One dam was buried under boulders and rubble on the upper Alaknanda River. A second dam was damaged by silt from the flood tide that poured into its powerhouse and fouled its generating turbines. A third dam, under construction, was seriously battered by the Mandakini River’s flood waters and the boulders that were pushed along at the speed of a livestock stampede. Reinforcement bars, bent like wind-whipped wheat, now form a tangled thatch of steel at the base of two broken support columns. A fourth dam — also under construction, but higher up the river — was completely pulverized and washed away. Though I have plenty of questions about policy and dam design that I am looking to answer this week in Delhi, it seems to me that what happened in June, and what continues to unfold along the Mandakini and the Alaknanda rivers, has implications for more of Asia and the rest of the world. The Himalayas are viewed as a prime hydroelectric production region: valleys are tight here, water is abundant, and rivers fall fast and with immense kinetic energy. China also has a big hydro development program underway on the other side of these big, unstable, treacherous mountains. India and China see in hydro development an opportunity to diversify their electric-production sector, reduce their reliance on climate-changing coal, and develop cleaner energy sources. There are also job, technology, and durable economic benefits from building big dams and power stations. Still, the consequences of dam building to fisheries and the landscape are important and measurable. Climate change is melting the Himalayan glaciers and producing more serious rain events, as we reported extensively in our 2010 series on the region. As India, China, and other neighbors push higher up in the Himalayas to build energy-producing projects, the mountains are pushing back. In June, they pushed hard. A lot of people were killed. A dam disappeared. Another was buried. Two more were damaged. By the end of this trip, I’ll know more. And next year, Circle of Blue and the Wilson Center will publish what we’ve learned as part of our new Choke Point: India project. 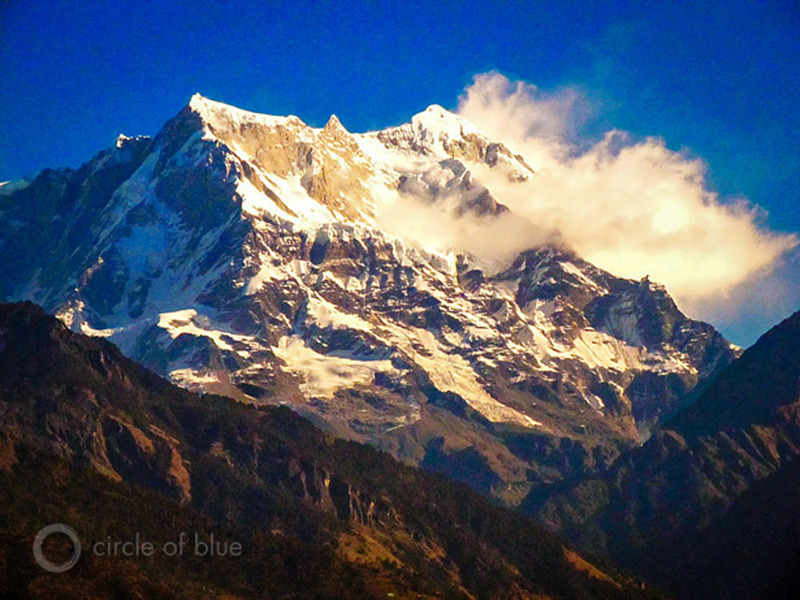 Do you live, work, or travel to India’s Himalayan region? If you read our previous reporting on India, what did you think of it? I’d love to hear from you. Send me a tweet @modeshift, contact Keith Schneider directly, or comment below. Choke Point: India is produced in collaboration with the Woodrow Wilson International Center for Scholars and its China Environment Forum, with support from Hewlett Foundation and Climate Works and initial support from Skoll Global Threats Fund. The Wilson Center’s Asia Program, which provided research and technical assistance, produces substantial work on natural resource issues in India, including articles and commentaries on energy, water, and the links between natural resource constraints and stability. I was searching for information regarding the Alaknanda Hydro-electric power project and got directed here via Google. Your reports are very insightful. I was there in Uttarakhand on June 15-16 2013, when it all happened. I’m a management student and had gone to tour Uttarakhand (Rishikesh, Badrinath and Auli) along with two friends. On our way to Badrinath, we saw this huge hydel project at Srinagar and thought how big man-made things can be. The dam had brought the mighty Ganga (Ganges) river to a standstill, in the reservoir and a few kilometers upstream. We recalled a documentary on the building of the Hoover dam in the US. Little did we realize how dangerous the implications of such things can be. The mountains in Uttarakhand are young and the zone is prone to landslides. On our way back on June 16, we watched the destruction of those areas. The dam which had seemingly stopped the river in its course, was helpless on our way down. All the gates had been opened, water gushed through them with immense force, and it had flooded thousands of low-lying houses downstream (they were built too close to the water in the first place). The return journey to Rishikesh took about 22 hours (which had taken only 12 hours on our way up). We were in the car for full 22 hours, stuck in frequent jams and clearing of landslides for hours during that period. Our car driver, who was a local, saved our lives. He insisted that we continue our journey through the night. The floods are unforgiving. We reached Rishikesh the next morning and saw in the news that many roads had been washed away. Thousands were stuck, many had died, in the places we had been one or two days back.